15th August is the most important day for the Nation …….and in 2014 – it did dawn specially …. On the 68th Independence Day, PM Shri Narendra Modi delivered in style his first Independence Day speech from the ramparts of the Red Fort. The Prime Minister spoke of building a brave, new India — a country in which every citizen has a bank account, women are safe, parliamentarians adopt villages, cleanliness is a priority, and much more. On the occasion, he adorned a Jodhpuri bandhej safa (turban), a common sight in western Rajasthan, which was the cynosure of all eyes. Modi, while delivering his speech at Lal Quila, mesmerized his audience with his effective speech which was delivered ex-tempore. 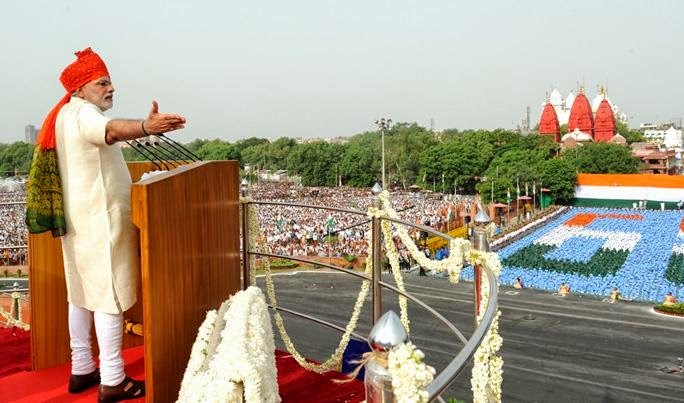 Prime Minister Narendra Modi broke a three-decade old tradition overruling the security agencies and spoke without any bullet-proof shield from the ramparts of Red Fort. The last time a PM did so was the late Mrs. Indira Gandhi. Ever since her assassination in 1984, bullet-proof shields for PMs at Red Fort made an appearance and became more and more expansive till Manmohan Singh spoke from inside a full 360 degree bullet-proof enclosure since 2004. The Prime Minister made a surprise announcement to replace the once-powerful Planning Commission with a new institution that will foster cooperative federalism, facilitate public-private partnership and help in better navigation of the changing economic landscape. He connected with the audience effectively and emotively as they clapped and cheered when Modi outlined the policies his government will initiate en route to a new India. The speech was seen as an attempt by Modi to rise above politics and reach out to a cross section of society over issues that have stoked both public anger as well as expectations from the government. 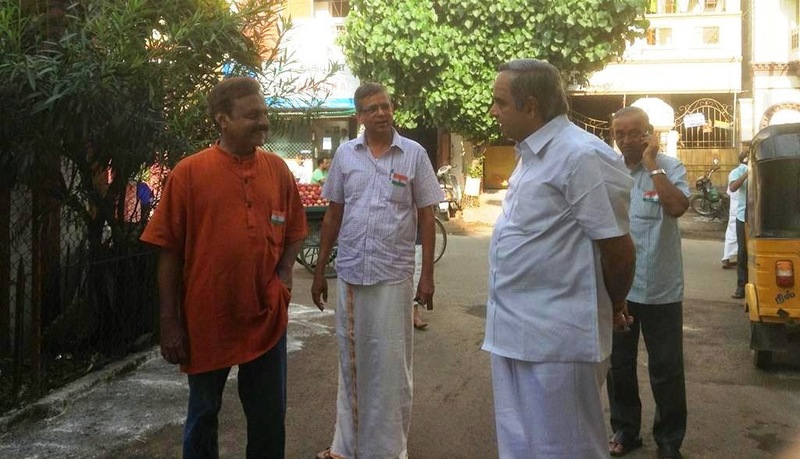 In Triplicane, at SYMA medical Centre, National flag was hoisted by Shri Murali of Sri Krishna Sweets. At Sirvi Samaj Bhavan, SYMA with Lions Club Venus and Sri Sankara Eye Hospital Pammal conducted eye camp for detection of Cataract and free surgery for those afflicted. 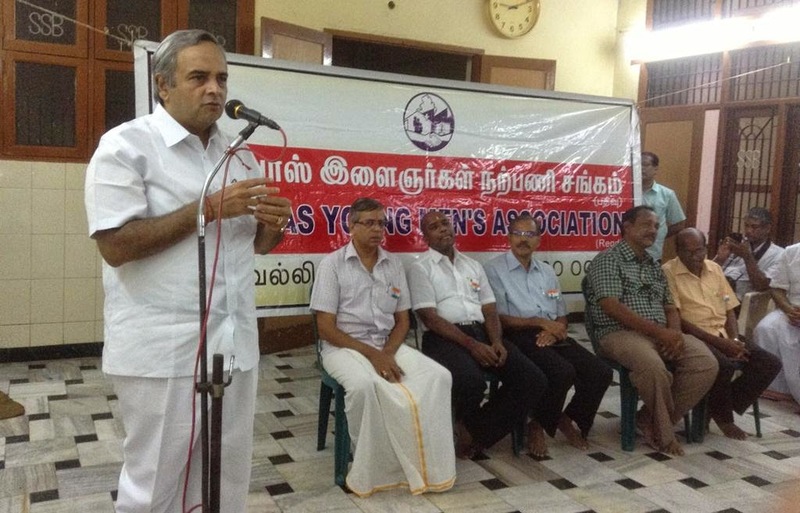 The Chief Guest was Shri Murali, Sri Krishna Sweets. Yours Truly, welcomed the Guests, spoke about SYMA and introduced the guests to the audience. Wg Cdr V Shankar, Hon Executive Director and J Babu, CEO from Sankara Eye Hospital were present. Around 195 persons were screened – 34 were found afflicted and will undergo free cataract surgery shortly. Around 32 persons were prescribed glasses, which will be given free to them by SYMA.